23.05.2010 Updated to fix hyperlink columns (splits the hyperlink by the first “, ” to separate URL and description). 20.05.2010 Updated to support hyperlink columns formatted as hyperlink and hiding of empty “rows”. 26.02.2010 Updated to support multiple lookup columns. Here is is an example on how to display information from another list based on a lookup column connection. You have a single choice lookup column connection to another list. When selecting a value from the lookup column, the script pulls the information from the “lookup source” and displays it below the lookup column. The sourcecode for the file “PullInformationFromConnectedList.js” is found below. * "LookupFIN" id the FieldInternalName of the lookup column. You must change the list Guid of the “target list” to match your list, the “arrOfFieldsToReturn” to match your fields and the “Lookup column” FieldInternalName. To use for multiple lookup columns, just build another “argumentObj”, and call the function “init_displayInfo” again with the new “argumentObj”. Save as “PullInformationFromConnectedList.js”, mind the file extension, and upload to the script library as shown above. Superior & innovative work, Alexander! Can this accomodate several (an array of) lookup fields? another great one. Now logically I should be able to grab any one of the displayed values and write it to a field. How would I grab the value? How do I refer to it? i don´t get it/don´t know it where to add the ID Attribute. Can you plese give me the code line? Will this work with a custom field? I have not tested. It depends on how much this field differs from the standard field. If you test it, please let me know if it does work. Now that I got the array working correctly, is it possible to add this to a CEWP on a DispForm? The DispForm lookup fields tend to be hyperlinks to the target list but is there another way? What functionality were you thinking about? – click to preview in form rather then open link? I was imagining that from my main list, I would have a field named [Contacts] using a multiple lookup. I would then add several names from a “Contacts” List. In the main list’s DispForm, I could hover on a Contact’s name and see the fields from the Contact’s List info. I will be posting another solution (the one i mentioned in the email) during the next week. It will do what you require. I like your code. BUt I have some different requirement. Instrad of dropdown, I have text box, I want that once user enter any value it should validate by clickon OK button, if record exist in another list then it should allow to save otherwise it should show message in red coloe. Could you clarify previous comment about writing a value to a field with an example maybe, I’m confused about placement of elements in the script. Add this function to the CEWP code and call it to alert the value. The variable can be used to write the value to a field if you like. I added this code but your last two sentences confuse me. What I want to do is take lookup value and write it to a field called Receiver (as an example). What is the write value code and where do I enter Receiver as the field to write it to? Here’s what I have so far. Thanks as always! Sorry I screwed up posting that code…. Sorry I’m still not getting it. I get the tutorial example to show up but I don’t get the input into the field. Thanks as always for your help. I tried it that way too before and it didn’t work. I’m still stuck. I would actually be fine if fields were populated from the dropdown (not just displayed) if that changes anything. Is it me? It seems simple but it just flat out won’t work for me.Thanks a lot! You must trigger the function to get it to “pick up” the value and write it to the new field. The best method is by adding a call to it in the function “PreSaveAction()”, as this function is automatically executed upon save. Thanks for the reply as always. I added what you had and now it shows the value as null and will not allow me to click OK to save. There is a value that should be displayed besides null so that is not triggering properly either. Sorry to be a pain! Thanks a ton! I have updated the code in my previous comment. Regarding the null – use IE Dev toolbar or Firebug to locate the correct <tr> and <td> in the table. Thanks. That accepted the change, but it is still returning the value of null. I’m guessing it’s something in the getVal code? I downloaded both but can’t figure out where it identifies the tr and td? I can highlight it and see code but not the tr and td specs? I see the tr id customListAbstract_Lookup. Then I see where the table is added. I see where the first tr. This should be the second tr. Is the fieldinternalname of the lookup column supposed to be the id of what it is looking for in the other list or the fieldinternalname of the dropdown that is selecting it? Where I errored is exactly what I just mentioned…it should be the dropdown ID not the lookup from the other list. I think that did it…for now haha. I’m sure you have this somewhere but can I hide the field that will be filled so it is not seen – therefore preventing someone from thinking they have to fill that part out (since it will be filled and displayed on DispForm)? Thanks man you are incredible! Excellent man! This works perfect. I am going to have a lot of items to pulling and populating. Is the easiest way to accomplish this by doing getVal2, getVal3, etc. for var and fields of each. I’ve made it work once so I’m good with it, I just wanted to know if you knew an easier (cleaner) way. I’m also going to use your newly published read only trick for the edit view. This may help in those fields where I’ve populated from the lookup and prevent them from thinking they should change those when editing. Thanks a bunch! Alright leave it to me to find a problem. I added this code to the Edit form and the problem is that if someone makes an edit it does not recalculate the lookup. Even though the lookup is set correctly, because the view table does not reappear it defaults everything back to null. I even tried your code to set the autopopulated fields to read only and that didn’t help. If you could answer this and the above question when you have a minute I would greatly appreciate it! Thanks! Or am i missing your question? I’ll try to explain better. In NewForm everything works fine. I also added the code to EditForm. The function itself works fine when performed. But if I go to EditForm on an item and don’t do anything at all and click OK it wipes out the fields it wrote to in NewForm and resets them to null. I believe this is because in EditForm the Lookup field is already selected and thus the table that the code is writing information from is not displayed. My novice theory is that maybe there is an alteration to the code that will set the table to display in EditForm based upon the selection that was made in the Lookup field previously. I hope that is a better explanation. Thanks as always-this is a huge help. It will then only update the field if a user updates the lookup column. You are correct that works. I didn’t understand your first explanation I guess. Thanks for the example that helps me the best. When you have a second today can you check this code and make sure I’m doing this the easiest way possible? I am going to have quite a few lookups and field writing code so there may be a condensed way to do it but this is the only way I’ve been able to get it to work. Thanks a lot again! Also, Can I somehow make this work with People Picker. Check your script references and make sure they are correct. About the people picker: I’m not sure what you mean, please clarify. But still it’s not working… As for the script references they are correct as I inspected using firebug and they are loading correctly onto the page. Regarding the People Picker which is my actual requirement, by default it gets you just one column which is specified in “ShowField” but I need to be able to see some more information like First Name, Last Name, Phone… when a user is selected. This should give you the full function in a dialog. This is not connected to the people picker field, but take a look and give me a hint if you cannot get it working. Hi Alexander, I have a similar question to Charlie above. I have a list of Contacts that is alookup to a Facility list which contain multiple lookups. I would like the phone number and email address of the person selected to show up on the Display Form. Also, if you have multiple lookups where do you reference in the PullInformationFromConnectedList.js script. Maybe I am doing something wrong here because I had to change LookupFin to “Director” (a column in my list). Thank you for your help with this. I will be posting a solution that gives you the ability to do his. Hopefully it will be ready during next week. Your solutions are great but I have a question. I have a text field that I have converted to a dropdown lookup field based on one of your other solutions. I need to have this field display information similar to what this code is doing on the form. So, when I select an item from the drop down list it will show the table and items selected. Do you think this is possible and quick to accomplish? I’m on a tight deadline for a resolution. I do not want to use Microsoft’s lookup field as I’ve found it can be buggy and I really like your convert to drop down code. If you need more details, please let me know. // The onchange event calling "pull info script"
Just remember to change the value for “LookupFIN” in the “argument object”. Code updated to accommodate the first and third request. The issue with the people picker cannot be recreated. Please give me some more info to go on – and ensure you have the right FieldInternelName for the field. Thanks Alex, I’ve tested the new code, with people picker you where right the internal name was wrong, sorry. I can see the problem is on the “,” characters included on the web address, is possible to fix that? Is the information stored in a SharePoint Hyperlink field or in a single line text field? If it is stored in a hyperlink field, what is the description for the hyperlink? which is part of the web address to googlemaps, exactly where the “,” char is. The code is updated to split the hyperlink by the first “, ” for separating the URL and the description. and call the function three times with init_displayInfo(argumentObj1); , init_displayInfo(argumentObj2); and init_displayInfo(argumentObj3);, correct? b) All the lookup dropdowns seem to be attached to the upper right corner of the cewp that is holding the lookup script, any idea why? I’m using the script on a newform.aspx with a combination of TabsInForm, FieldsSidebySide and BuildHeadingsFromArray CEWPs. Correction to b), it’s not the cewp that is holding the script, I’ve moved it around and the dialog is staying below the form on the right side. Ok, sometimes it helps to talk about it. I solved my problem with a), now I have three working lookups on that page/form. The only problem left now ist b), the dropdowns to the lookup fields are showing below the form. I suspect it has something to do with either the tabsinfom or fieldssidebyside cewps. I’ll do some more testing and keep you updated. Ok. it’s verified. As soon as I take the fields out of the TabsInForm CEWP the fields are displayed above the TabsInForm and the dropdowns are working as expected. Any chance for a fix to have the Lookup dropdowns within Tabs? Ok, trying to break the posts-per-day record :-), one more thing, the additional information is not being displayed in a dispform.aspx, here are only the lookup values as hyperlinks to the lookup item. Is that the expected behaviour? Regarding the lookup appearing outside the tabs: this has to do with the “container” for the options being shared between all lookups in the same form. The positioning of the container is interrupted by the scripts. It can be fixed, but i have so little time that I cannot promise a fix. I have one requirement in Sharepoint. I have used your code(Above) but not working. 1). I have one list in Sharepoint called “Users List”. In that “User Name” , “User ID”, “E-mail” & “Company” are the columns.I inserted some data also. 2). I have another list called “Access Users”. In that “Title” and “Select user” are the columns. This column(Select User:) is lookup to “User Name” column in “Users List”(First List). 3). When ever i select any user from the lookup list(Select Users: list) it should display the corresponding details below that lookup column in the from. Please send me the code for this with step by step process. Iam new to sharepoint. I believe this is the exact function to this script, no modification needed. Just one question – for me it works a little bit slowly – on every choice in lookup field I see hourglass for ~2 seconds and then appears preview. This has to do with the query against the “connected” list. It is bound to take a second or so – and if your server is overloaded, the delay will increase. I was looking for a way to just display a set of instructions and I found this post. Very helpful indeed! I was able to get it to work for my form, but what if I didn’t want to use a Lookup column and instead just wanted to display my text when a radio button option was selected? For example, if a user selects the WBT radio button, they get info on how WBTs are created, but if they select the PowerPoint radio button, they get a different set of information about how PowerPoints are created. I have the informational texts in their own list in SharePoint, but with the Lookup column, the multi-line rich text field isn’t an option for display. If you know of a way to do this with or without the lookup, I would appreciate the help! Thanks! Is this for SharePoint 2010? The functionality in your posted is code is as below. When selecting a value from the lookup column, the script pulls the information from the “lookup source” and displays it below the lookup column. But i found its not usefull with display form. As, in it we are not selecting a value from lookup column. Its just displayed. Does any modification required to achive the functionality with display form. Did you say you updated this with a way to link back to the source, or a way to update the source? I have looked thru here and I cant see it or figure it out. I just need to be able to open the editfrom of the source item. I’m trying to get Steve’s code working. I’m getting the table but I’m not getting any results in my text box. I haven’t had the time to look at this one, but did the code you posted above do what you wanted? Yes, thank you, just wanted to share. In the future, how do we post code so it displays like yours with line numbers etc. I’m in need of some clarification for what value to place in the LookFIN variable. Do I create the lookup column in the list that will lookup information from another list and get its internal name? Or do I define the internal name of the column I want to lookup info from? “LookupFin” is the FieldInternalName of the Lookup column in the form you are adding this code to. Alex, this looks great however when I choose an item in the dropdown list that is connected to another list, I do not get any data. Inspecting the dropdown list, I see that no on* events are set. Is this correct? This one is a bit old. Which browser, jQuery version and which SharePoint version are you using? I am using IE 7 and Chrome 17, jQuery 1.6.4-min and MOSS 2007. I relooked my code and I forgot the ] after Expires, above. I also changed the init_fields function to the revised one with regex. I also get the event listener of change for the dropdown list. soap:ServerException of type ‘Microsoft.SharePoint.SoapServer.SoapServerException’ was thrown.Syntax error converting the nvarchar value ‘undefined’ to a column of data type int. Any ideas why the value is undefined? Thanks. Thanks for this; it’s been extremley useful to me, but I’ve run into an issue. I’ve followed this guide along with the modifications in order to populate a free text field with information from the lookup. It’s working when I edit an existing document in the library but it’s failing to populate my free text field when I upload a new document. Any ideas? Sorry for the late reply, have you figured this one out, or do you still want help? I’m trying to set this up on Sharepoint 2010 Standard edition and it is not working. I’m using the jquery version 1.3.2 from this link. In SP2010 you more or less have this feature built in to the lookup column. Go to list settings and tick the box under “Add a column to show each of these additional fields:” for each of the additional fields you want to show (in DispForm and list views). This solution is not tested in SP2010. 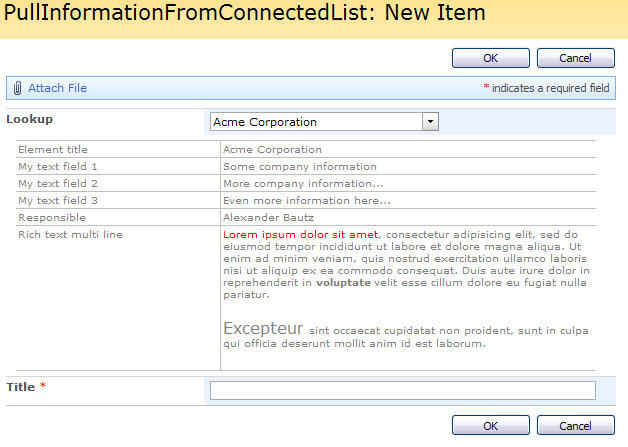 SP 2010 builtin lookup column type feature only shows additional fields on Diplay and edit forms but not new forms. Also it does not allow you to pull multi line text fields. These are the two things I was trying with your solution. I’d just like to say that I love this add in and I can confirm that it does work in SharePoint 2010 without any real modification.